Vault of Light: 20 Days of Gold Making - Day Six. 20 Days of Gold Making - Day Six. "Which market has made you the most gold over the years?" Jewelcrafting has always been a huge part of my gold making. During Cataclysm I put a lot of time and effort into the gem market. I was lucky enough to be on a medium population server with very little competition. I started off selling gems during Wrath of the Lich King expansion. 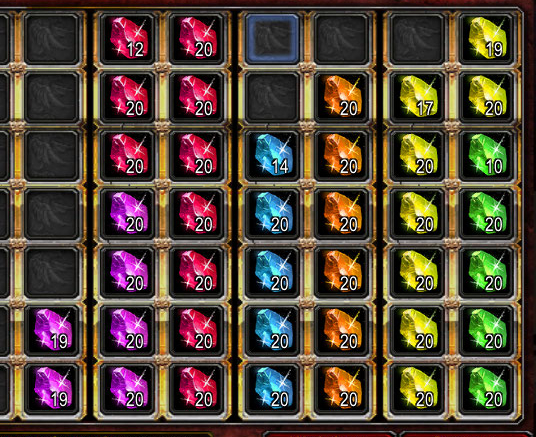 Every time I had excess honour I would purchase gems from the vendor in Dalaran and cut them into popular cuts. I eventually started picking up uncut gems from the auction house to cut and resell for profit. During Cataclysm I was heavily invested into the Obsidium Shuffle. This involved buying Obsidium or Elementium ore - prospecting the ore which yielded blue quality gems as well as green quality gems. The blue gems were cut into popular cuts and the green gems were used to craft jewelery to be disenchanted and made into scrolls. With the release of Mists of Pandaria the gem market changed. In previous expansions learning recipes to cut gems were obtained via daily quests which rewarded tokens, allowing you to purchase the cuts you wanted. MoP introduced a new system which gave jewelcrafters a daily cooldown for each colour of blue quality MoP gem. Using three uncut blue quality gems (Primordial Ruby for example) rewards you with an item called Facets of Research. Within this item will be two pre cut Primordial Rubies and you will learn a new randomly selected pattern for Primordial Ruby. You also have the option to learn blue quality cuts by using three Spirit of Harmonys' this method doesn't have a cool down. This meant that for a good few months at the beginning of the expansion uncut gems were often more expensive than cut gems. As people needed them both for research as well as the new Jewelcrafting Panther mounts. The demand for uncut gems seems to have settled down a lot in the past month or two so the prices have dropped and with content being released at a higher rate than previous expansions the gem market is still thriving. Mists also changed the way that Perfect cut gems worked. Previously, cutting green gems in Cataclysm had the chance to give you a Perfect cut. These gems had an additional five stats compared to an ordinary green cut gems and five less than a blue quality cut. Green gems in general have always been considered garbage but could provide a cheaper alternative if you knew you would receive an upgrade very soon. Cutting green quality Mists of Pandaria gems still gives you the chance to proc a perfect gem however they're now blue quality and have the same amount of stats as a typical blue quality MoP gem. You can often buy uncut green quality gems for very little in order to mass craft them into popular cuts hoping for perfect cuts. WoWPopular is a great resource for finding out which cuts to start with if you're new to Jewelcrafting. They list the most popular gems and enchants for every class and spec. The Undermine Journal also provides a fantastic breakdown for gems for your server. Under Crafted > Jewelcrafting. Make sure to read the text underneath "The Gems Array" to fully understand what the charts are showing you. I love the Gem market, partially because it's always been good to me and because it's the profession of my main. It's just her thing. Good read. :) I have a lot of memories with jewelcrafting myself. As my first (and all to follow actually) character was a draenei, I chose jewelcrafting as her profession because of the racial bonus to it. It was really expansive for me to level up, and probably the reason why I couldn't afford a mount until 7 levels after it opened up for me. Now in Mists I have actually just started doing the discoveries. The first months I'v "survived" on perfect cuts, but then the completionist in me finally insisted that it was nonsense to not get all the available recipes. So now I buy the cheapest raw rare gems (usually yellow or blue) and discover that way. I started off in MoP with two JC's so I'd learn red/orange/purple cuts on my Priest(main) and yellow/blue/green on my Shaman alt. Like you completion got the better of me so I'm now trying to learn all of the cuts on my Priest via the same method as yourself. Have you given searching for eggs a try for Cloud serpent reputation? I'd imagine they're hardly camped as much any more? Might be easier and faster than doing the dreaded daily quests. This is now a character I play very little. I'm exalted on my main, so I get the double rep. Did look for eggs, but found out I couldn't be bothered with it. So I'm just giving them some fish cakes now and then, hehe... It's no rush, the 200 mount achievement is still a couple of months away! Thank you, credit to Nev for coming up with the idea! You should check out some of the other participants blogs. Some great information out there.